Despite a recent surge, shares of Knight Capital are down 71% year-to-date. Let the bidding games for Knight Capital (KCG) begin. The struggling trading firm received its first public buyout offer Wednesday from rival and partial owner Getco. In an SEC filing, Chicago-based Getco said it was offering $3.50 a share, representing an 18% premium over Knight's closing price on Tuesday. 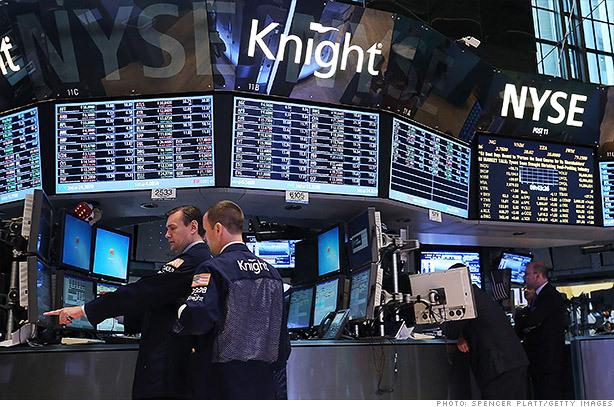 The news sent shares of Knight surging Wednesday, with the stock briefly touching the $3.50 mark. Under the proposed terms, Getco Chief Executive Dan Coleman would become chairman and CEO of the merged company. Knight CEO Tom Joyce, whose contract is set to expire on Dec. 31, would become the non-executive chairman. Coleman said the new firm would be a "magnet to customers, talented traders and technologists, which is especially important in an environment of lower trading volumes and higher regulatory engagement." Knight Capital acts as a middleman in the markets, completing investors' orders to buy and sell stocks. In August, the company lost $440 million after a trading software snafu sent numerous erroneous orders in NYSE-listed securities into the market. Getco is a high speed electronics trading firm that was part of a consortium that rescued Knight after the August debacle. The group, which also included TD Ameritrade (AMTD), Blackstone Group (BX), Stifel Nicolaus, Jefferies Group (JEF) and Stephens Inc., paid $400 million to acquire a majority stake in Knight. But the trading blunder left Knight in a precarious financial position. The firm has lost out on trading orders and seen an exodus of several high-level executives. Whether or not the company inks a final deal to sell itself, Knight is expected to be forced to radically restructure the company, according to analysts. Any next step for the company will likely result in the loss of a majority of Knight's 1,600 employees. Knight Capital confirmed that it received the letter from Getco and declined to comment further. The firm is expected to see other bidders emerge in the next few days, including Virtu Financial, another high-speed trading firm. Virtu did not return calls for comment. In August, during its frantic hunt for rescue financing, trading firm Citadel made two offers for Knight. This time around, Citadel is unlikely to bid, according to a source close to the situation.